If you’ve got a Will, it’s a good idea to check it’s up to date. Well, passage of time, changed relationships and updates to legislation could mean it no longer does what you intended. 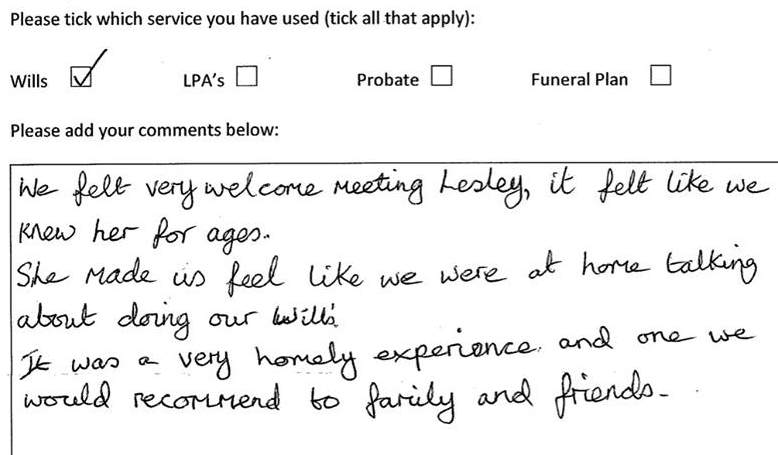 This is why we offer a free Will review service. It is worth reading our Guide to Wills before your appointment. This will help you think through your wishes for how your estate should be dealt with when you die. When we meet, you can tell us how you’d like to deal with your estate. Then we will check whether or not your existing Will meets these requirements. If not, you can instruct us to draw up your new Will. Our Will writing costs are fixed, starting from £199 for a single simple Will. You can find out more on our Wills page, or simply phone us to ask for more details.